Despite the significant multi-year outperformance of domestic markets over most foreign markets, we continue to emphasize diversification on a global basis. Looking ahead, critics have pointed to a strong dollar, and its potential for further appreciation relative to major foreign currencies, as a significant headwind to the returns of non-U.S. investments. However, though a strong dollar may hinder near-term results in international investing (as foreign investments in a weaker currency are translated back into a stronger dollar) we believe the effects over the long-term are fairly negligible. Over the past few months, the US dollar has enjoyed a sizeable rally relative to other major currencies. Driven by more favorable growth prospects relative to foreign economies, investors have moved into dollar-denominated assets, which have resulted in a sharp appreciation of the dollar. As seen in the chart below, the dollar has appreciated nearly 20% versus major currencies over the past year. 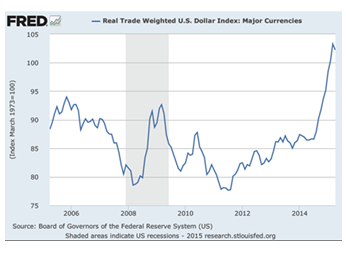 The principal reasons for the dollar's strength are both economic and investment related. Compared with the sluggishness of the Eurozone and Japanese economies, slower growth in China, and growth in other emerging markets abating, the U.S. economy looks relatively strong. The Federal Reserve has begun to tighten monetary policy by ending its quantitative easing and may even raise rates later this year, which would mark the first increase since 2006. With U.S. monetary policy tightening while other central banks do the opposite, investors have been targeting dollar-denominated assets. There has been much discussion lately regarding the direction of the US dollar and its effect on international returns (we personally believe the dollar will be range bound for some time). Yes, fluctuations in the dollar may cause wide return divergences over shorter time periods, but as you can see from the table below, over the long term the effect is minimal. More importantly, the cost of hedging currency risk generally outweighs any benefit at these levels. Looking forward, given the potential headwinds facing today's financial markets â€“ uneven global growth prospects, increasing geopolitical risks, and rising interest rates â€“ we remain committed to diversification as a core strategy in investment portfolios today. With that in mind, we continue to allocate both across traditional asset classes, such as international and emerging market equities, REITs and commodities, as well as non-traditional ones, such as alternative strategies.